Last week, Senate Majority Leader Mitch McConnell (R-KY) took to the chamber floor and laid out his case for the Hemp Farming Act of 2018, calling hemp a cash crop for the nation’s struggling farmers, a modernization of federal law, a “new spark” for the U.S. economy. McConnell was also the driving force securing the language in the 2014 Farm Bill that has allowed states to create their own hemp pilot programs – of which 34 states have taken advantage, according to the National Conference of State Legislatures. The new bi-partisan legislation would effectively codify the language in the Farm Bill while allowing hemp farmers to access federal funding for research and protecting farms under the Federal Crop Insurance Act. “The results of [the pilot programs] have been extraordinary,” McConnell said during his remarks introducing the legislation, explaining that in his home state hemp is being used for hempcrete and home insulation, its extracts researched for health benefits, and it’s become an ingredient in beer. The industry, McConnell said, created 87 jobs in Kentucky last year and more than $16 million in revenues. The current policy, Wyden contended, is “somehow based on the idea that hemp is a dangerous drug” and has led to handcuffed farmers and diminished consumer options. On Monday, the Senate invoked Rule 14 – a procedural move allowing the measure to skip the committee process – effectively fast-tracking the bill, according to a Hill report. Using the move doesn’t always guarantee that a bill will make it to the floor to a vote and McConnell’s office told the Hill that they didn’t have guidance or an announcement about when, or if, the measure would get a vote. 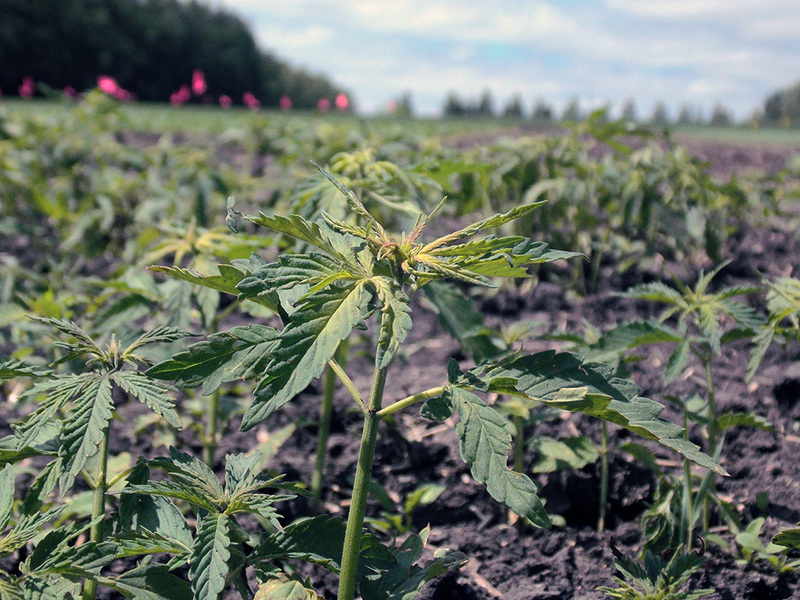 A field of young hemp plants photographed on a sunny day. Photo credit: Lesley L.
The group said the measure would allow U.S.-grown hemp to gain organic certification from the Department of Agriculture’s National Organic Program (which already recognizes certified organic Canadian hemp products); protect interstate commerce; normalize financial services; ensure water rights for hemp farmers; and advance research opportunities. Moreover, the organization says the bill would protect “the legality of production and consumption of the diverse array of hemp products,” including CBD. The HIA is currently locked in litigation with the Drug Enforcement Agency over their move to classify CBD under the federal definition of “marijuana,” therefore a Schedule I drug. Paul Armentano, deputy director for the National Organization to Reform Marijuana Laws, disagrees with the position of the HIA, pointing to the policies of the DEA, Food and Drug Administration, and National Institutes for Drug Abuse that treat CBD as Schedule I substances. The bill defines hemp as “the plant Cannabis sativa L. and any part of that plant, including the seeds thereof and all derivatives, extracts, cannabinoids, isomers, acids, salts, and salts of isomers, whether growing or not, with a [THC] concentration of not more than 0.3 percent on a dry weight basis.” Products that meet this definition would be removed from the Controlled Substances Act, according to the bill. None of the bill sponsors – McConnell, Wyden, Sen. Rand Paul (R-KY), or Sen. Jeff Merkley (D-OR) returned requests for clarification on the CBD issue. However, in 2014, McConnell told the Lexington Herald-Leader that he was frustrated the DEA was using “its finite resources to stymie plainly lawful hemp pilot projects” while the state deals with an opioid epidemic. In an interview with FoodNavigator-USA, Eric Steenstra, president of Vote Hemp, said the Majority Leader is “making it very clear that CBD is included in the definition and will be part of the industry.” Vote Hemp and the Hemp Business Journal estimate the total retail value of hemp products sold in the U.S. in 2016 was $688 million. The analysts projected the market would grow at a 22 percent compound annual growth rate through 2020. The analysis found personal care products comprised 24 percent of the market in 2016 ($163 million), followed by CBD, food (19 percent, about $130 million each), industrial applications (18 percent, $125.5 million), consumer textiles (14 percent, $99.5 million), supplements (4 percent, $26 million), and $14.4 million (2 percent) in other consumer products, such as paper and construction materials. The report suggests that CBD will grow at a 53 percent annual rate.